A new Lagoon catamaran 40 model will be available this Autumn. Builders say the new size represents a combining of two Lagoon generations, the 39 and 400. The new yacht has aft rigging for greater performance and a self-tacking jib for easier manoeuvring. The cockpit, like the highly successful 42, has a well-thought out interior by Nauta Design. The new 40 is available with three or four cabins. Lagoon is also offering a new 50–footer. With its two new models, Lagoon now offers a full line of catamarans from 38 to 77 feet. The model is available from yacht brokers MGM Boats Ltd in Ireland. “I’m busier now than I was in June or July” is the cheerful response from John McDonald down in Kinsale at the south coast MGM Boats boats for sale office writes W M Nixon. Normally there’s a slowing down of sales as Autumn draws in, or brokers might find their time being taken up by the perennial tyre-kickers who will only move if an absolute bargain is in the offing. But September 2016 has been different. The affable and informative McDonald reckons it’s the post-Brexit effect. Much and all as Brexit on June 23rd was only an electoral decision, and nothing concrete has as yet flowed from it – indeed, it could take years for any significant changes to kick in – the feeling is that when a major decision is coming down the line, every other decision is deferred. So the fact that a decision has been made, whatever about its longterm consequences, is better than a state of uncertainty. For Irish boat buyers and sellers, the main interest lay in the effect on the euro-sterling rate of exchange, and we’ve reported on Afloat.ie about the way Howth YC maximised on the initial plunge in sterling by sending off a very focused procurement team to the Solent area in search of four good J/80s for use in the club’s sailing development programme. They hit the ground running to find the exchange rate in such such a sweet place that they came back with five J/80s. But now things have stabilised, rates of exchange seem to have settled down with sterling at a lower level, and boat buyers can move with a clear idea of the true comparable prices between boats in the Euro zone and across the water. 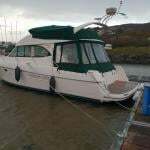 This Westerly Fulmar 32 is back on the market with MGM Boats through a change in the owner’s circumstances. The significance is that an already good example of the noted collaboration between leading designer Ed Dubois and volume boatbuilders Westerly Marine is available at a price of €33,950 which seems even more attractive when you factor in the impressive array of new equipment and sails she has acquired during the past year. The Westerly Fulmar 32 is the very epitome of a “sensible” boat. She’s a big 32–footer, yet the designer didn’t try to shoehorn in more accommodation than there was comfortably room for, and the result is she actually seems even bigger than she really is. But this doesn’t come with an impairment of performance. On the contrary, the Fulmar achieves the ideal of a more-than-respectable average speed when sailing on a cruising passage, and it’s all done in a sea-kindly boat in which the miles slip effortlessly by. In this case, the high standard of equipment is matched by a very good general level of maintenance, providing the ideal package in a very attractive size range, details here. Prizes in 14 divisions plus were presented at Dublin Bay Sailing Club's (DBSC) MGM Cruiser Challenge on Sunday after two days of competition at the annual end–of–season regatta hosted this year by the Royal St. George Yacht Club. Race results for all classes are here and below are photos from the well attended prizegiving at the Royal St. George YC by Joe Fallon. Scroll down to the end of the page for a photo gallery. MGM DBSC Cruiser Challenge Results HERE! Quarter Tonner Cartoon from the Royal Irish Yacht Club was the class three IRC winner of this weekend's MGM Boats sponsored DBSC Cruiser Challenge. In two days of very contrasting weather, the 14 divisions concluded this evening in light winds and bright sunshine. Saturday's racing was dominated by heavy downpours. The all–black quarter–tonner owned by Sybil McCormack and Ken Lawless was four points clear of Asterix from the DMYC. Third was RIYC yacht Barry Cunningham's Quest. Tim Goodbody's J109 White Mischief was the winner of the biggest fleet in the DBSC Challenge. The Royal Irish sailor was the winner by one point from club mate Colin Byrne in the XP–33 Bon Exemple. The 15–boat IRC one division also featured new J109 entry on the bay, Chimaera, sailed by Royal St. George's Andrew Craig. Up to five races were sailed in some classes but others sailed only two. Full results for all classes are downloadable below. Irish Jeanneau dealers MGM Boats have announced details of the latest Jeanneau yacht, the Jeanneau 51 that is designed to complement the existing 'Yacht line' as an entry crossover from the regular Sun Odyssey line. The new model joins the 54, 57 and 64. According to MGM's John McDonald based at the firm's Kinsale office 'the new model draws on the design cues of the 54 yacht (30+ ordered already in 12 months) with chaise lounges on either side of he companionway forward sun pad, large cockpit area, luxurious interior and master cabin forward with VIP cabin aft. Most folk will think of sailing boats when they dream of breaking away from everyday life, and voyaging towards the distant horizon with all those exotic places and ports beyond writes W M Nixon. But some very special motor-cruisers evoke the same feelings, and when you contemplate the potential of this twelve-year-old Trader 535 from MGM Boats in Dun Laoghaire, you can almost see the palm trees waving gently in the breeze beside some secluded and sheltered paradise island anchorage, and this handsome craft set in the midst of it riding gently to her cable. Yet you don’t need to be in the world’s warmer cruising zones to appreciate this Tarquin Marine design’s attractions. She has been created with all-weather comfort in mind in a successful hybrid concept. There’s just enough of a hint of the trawler yacht about her to give the reassurance of rugged seagoing ability, while at the same time there’s a sweeping elegance to her lines which means she still looks well in the most stylish company. Be warned, however, that this is not a boat for the casual sailor. 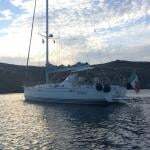 By that I don’t mean you have to be a complete techie to run her – she is conceived and organized very much with the reasonably competent owner-skipper in mind, and you don’t have to be a fully qualified marine engineer to get confident use of her. But the point I’m trying to make is that to do justice to a boat of this calibre, you should be thinking of frequent use, and living aboard for long periods as you make leisurely voyages along fascinating coastlines – as she’s currently based in Dun Laoghaire, a proper and detailed round Ireland cruise would be a good start. She’s pushing towards 55ft in overall length, so it’s reassuring to know that in addition to 510hp provided through the main power plant, she has both bow and stern thruster to assist with berthing in tricky corners. For the fact is, the Trader 535 is a proper little ship. She’s laid out for civilised adult living with sleeping space for just six with two double cabins, two bathrooms, plus a twin. A feature which genuine seagoing types will appreciate is that the galley is aft of the saloon, which minimises motion for that most valuable crewmember the ship’s cook, while maximizing space with the aft chines in the hull facilitating exceptionally large stowage lockers. Although she was built in Taiwan and has the inevitable Taiwanese teak in preponderance on deck and round the cockpit, below it’s refreshing to find the featured timber in the luxurious accommodation is solid maple, which thanks to its paler hue provides an additional and very real impression of welcome airiness. At a practical level, her hull below the waterline was Coppercoated in 2010, and this is still providing a most effective anti-foulant, as well as indicating that she has been in a caring ownership. The quoted price of €317,750.00 is indicative of the size and quality of the vessel under consideration, though it compares well with comparable craft elsewhere. More details from John McDonald of MGM Boats and the full advert here. Dun Laoghaire Marina, MGM Boats and Frank Keane BMW celebrated the start of the 2016 boating season at the weekend, showcasing a range of 'the finest' boats and cars available in Dublin. A number of both new and used craft were available to view off the gangway at the country's largest marina, including an impressive Lagoon catamaran, Jeanneau power and sail craft, all resplendent in the weekend's summer sunshine.